A new research report published by Transparency Market Research states that the global magnetic field sensors market has been growing at a remarkable pace.The report, titled “Magnetic Field Sensors Market - Global Industry Analysis, Size, Share, Growth, Trends and Forecast 2015 - 2021”, contains comprehensive research on the market that has been compiled using primary and secondary data. According to the research report, the global magnetic field sensors market was valued at US$2.0 bn in 2014 and is expected to touch US$3.5 bn by 2021, growing at an impressive CAGR of 8.30% from 2014 to 2021. The primary growth driver for the global magnetic field sensors market is the burgeoning automobile industry and rising demand for consumer electronics and appliances. This market is also being propelled by the huge demand for electronic compasses. Furthermore, strict government mandates across Europe and North America for using energy-efficient and eco-friendly devices is promoting the growth of the global magnetic field sensors market in these regions. These devices are important for achieving power efficiency through smarter electronic devices. 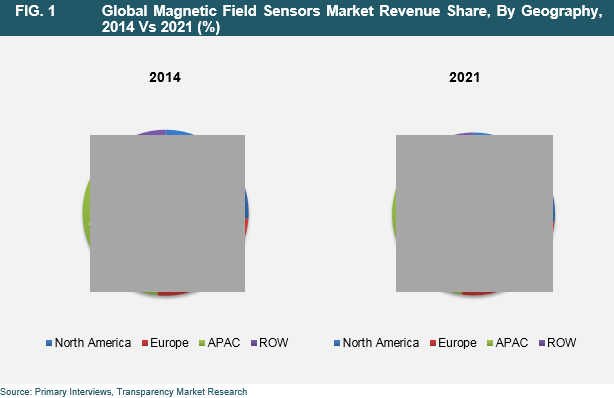 In addition, the growing economies of Taiwan, India, and China are also bolstering the growth of the global magnetic field sensors market with demand for latest technologies. All of these factors put together are expected to have a positive effect on the global magnetic field sensors market in the coming six years. Several government bodies across the globe are pushing for setting high standards for lower fleet-average fuel consumption. In the bid to do so, they are offering financial incentives for electrification of vehicles, which in turn is leading to reduction in fuel consumption in the overall automotive sector. A cumulative effect of this is seen on the increasing demand for electrified or electric vehicles. Owing to this, the use of advanced magneto-resistive sensors is expected to go up due to its usage in electric vehicles. The global magnetic field sensors market is segmented on the basis of technology, type, application, and geography. The technologies in the global magnetic field sensors market are low field sensor technology, bias magnetic field sensor technology, and earth field sensor technology. The types of magnetic sensors sold in this market are half-effect sensors, magneto-resistive sensors, SQUID sensors, fluxgate sensors, and others. Applications of magnetic field sensors are in automobiles, consumer electronics, the industrial sector, energy, power and utilities, healthcare, robotics, and aerospace and defense. Geographically, this market is segmented into Canada, the U.S., Mexico, Europe, Asia Pacific, and Rest of the World. Some of the important players profiled in this report are Infineon Technologies (Germany), Allegro MicroSystems LLC (U.S.), Melexix NV (Belgium), Honeywell International (U.S.), Micronas Semiconductors Holdings AG (Switzerland), Austria Microsystems AG (Austria), NXP Semiconductors (Netherlands), Asahi Kasei Co (Japan), and Memsic Inc. (U.S.). The extensive research report gives valuable insights into the company profile, financial overview, research and development activities, and investment outlook. The report also offers a SWOT analysis and Porter’s five forces analysis of these companies to the readers.